Jakob is a quagga (Equus quagga quagga), a subspecies of plains zebra. His colouration is a range of tans and browns with a dark grey on the inside of his ears. 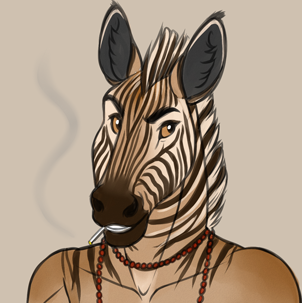 Jakob's head and neck are covered in dark brown stripes which fade out as they reach his torso. His eyes are a golden-brown. Jakob is an optimistic man who loves to talk about his spiritual interests with others. He enjoys learning about everything he can and is a bit of a bibliophile. He is very much a morning person and gets up at dawn daily, after which he partakes in a meditation session. If he doesn't have time to meditate or oversleeps, Jakob gets stressed and anxious. Although Jakob very much wants people to see him for his spirituality, underneath he can be grumpy. He often has trouble sleeping and so appears tired and fidgety much of the time. He is shy in social situations but quickly comes out of his shell when talking about his passions. Jakob collects and grows succulents and herbs, many of which he has named and regularly talks to. He lives a vegan lifestyle though he is careful not to push his beliefs on others, especially carnivores. Jakob sees no problem in smoking recreational drugs and is a regular consumer of cannabis, salvia, mugwort and other herbs. He claims that they help his shamanic journeying and help him chill out. Jakob does not drink alcohol. Because of the similarity in their personalities and interests, Jakob gets along very well with his neighbour Jan. The two friends can often be witnessed sharing some smokes in either of their gardens. Jakob works as a self-employed massage therapist and traditional painter. He uses his own living room as a make-shift massage room and takes clients by appointment. He has recently found out that he can sell his artwork online and is making a decent income from that. Jakob moved from a country flat to the city where he met Jan. They became great friends and often hang out together. His mother died from a terminal illness when he was only 11. Jakob claims this is what prompted his journey into spiritual beliefs, and that he looks forward to meeting his mother again some day. He is currently trying to reconcile his relationship with his father after a major falling out. Jakob is easily frightened by the paranormal and cannot watch horror movies without having a panic attack. He has an older brother, Adrian, who is an office worker in the city but he doesn't see him often. The two don't get along particularly well.